Beautiful Incentives: All natural cleaning on a budget. Meet Green Virgin Soap Nuts & Aluminum-free deodorant. Eco phenomenal! All natural cleaning on a budget. Meet Green Virgin Soap Nuts & Aluminum-free deodorant. Eco phenomenal! I strive to be all natural in everything I put on my skin or use in my household. That can be more a daunting task than ever imagined at times, but companies like Green Virgin are starting to make my life a lot easier. This company is dedicated to providing healthy non toxic products for as little as they can offer. Ken Marion, the founder is convinced that toxins played a big part in his brother's early passing from cancer. He is also a cancer survivor himself, so you can trust that he is dedicated to helping everyone's lives remain non toxic. Green Virgin sent me all natural aluminum-free deodorant and soap nuts. Soap nuts?? What are those? Well my friends, they are lil balls of nutty cleanliness and they are superb. Yep, these are actually a fruit that grow on trees in China and they make an excellent natural detergent. Nuts on a tree, yeah, you really can't get more natural than that! I tried the recommended 3-5 soap nuts in the convenient baggy for a large load of clothes. There was a little sudsing to be seen. Contrary to what many believe, sudsing is not synonymous with clean! When I took the clothes out to put in the dryer, they were clean as can be and smelled so fresh. It's hard to pin point the aroma. I would say the closest description I can come to is "fresh soap" It just smells very CLEAN. I was worried these lil guys would leave residue or not clean as well as the leading detergents and I was so pleased with the outcome. I think they may have even cleaned better. I love this scent so much more than the artificial "spring breeze" I don't know about you, but I get a whif of more than spring. More like spring with irritating perfume fumes in the air, assaulting my nose, type of "breeze"
As you can see, you get 83 regular wash loads, so this one bag will last you a long time, and at $10.95 you are getting big whopping bang for your buck. A highly eco-friendly and economical alternative to leading detergent and cleaners! Not only do they work as a wonderful detergent, but they are a multipurpose cleaner and have MANY other uses when combined with a few simple natural ingredients. 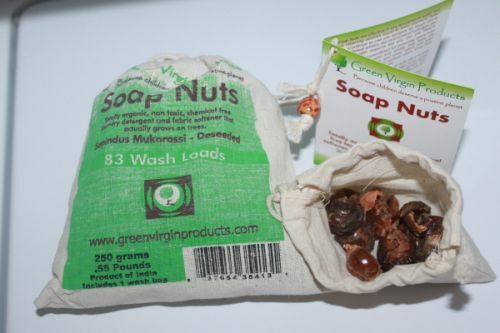 All purpose cleaning in rooms- Just boil the soap nuts and simmer for an hour, without the lid. Wait until cool and strain the liquid from nuts. It'll be good in a bottle for 3-4 days. It's natural, so it spoils fast without preservative. If you'd like to preserve it, there are several ways I found through a search. Steam cleaning carpets even, and GREAT for urine stains! I can't wait to use this for other cleaning methods. I think next I will make a solution with some yummy scented essential oils for cleaning my counters. I highly recommend these soap nuts! The next product I tried was their all natural deodorant made from just Mineral salts. Free of all toxins and harmful ingredients. I recently reviewed another natural deodorant that I loved and I was pleased to find that this one was just as good and a lot more economical. I will be honest, like they say in their description, some people have a break in period. It didn't work wonders at first, but i stuck it out and now I am odor free when I wear it. They theorize that this is because all the toxic build up and bacteria needs to come out first. I'm always in search for better and more natural alternatives for my body and it's important for deodorant not to have aluminum in it. As I had mentioned in my other review, it is what keeps you from sweating, but you actually want to sweat a little. Sweating purges the toxins from your body, so I have no problem with it, as long as I don't smell in the process. This is an interesting version, as you add water to "activate" it and roll on your under arms. What makes it even more convenient is the fact that it lasts up to 2 years with regular use! At $5.99 for one, i'd say that is about as economical as you can get. Both of these products will definitely be replenished when they run out and I will tell everyone and their dog walkers mother about this line. These are just a few of the products that they offer and you'd be silly not to check out the rest of their things, such as the Dr. Oz recommended Moringa tea & powder and their multipurpose cleaner. Visit Green Virgin to learn more! I really want to try some soap nuts! I've heard so much about them! Those soap nuts seriously are so cool. I love that fact you say they grow on trees! Thats unique. I really need to check this company out. Thank you!! These sound REALLY REALLY cool!! I HAVE to get them for myself, but I want to get the tree soap nuts for everyone for a super unique gift for the holidays! Thanks for letting me know about them! They would be perfect for gift giving and definitely going in my Holiday Gift Guide! Soap nuts? Never heard of them before, but they sound extremely multipurpose, so not only are using something super natural but think how much less plastic is being wasted by using this product for multi cleaning needs! Awesome! They're all around awesome and the money you save is phenomenal! I used soap nuts once before. I was skeptical before using them, but they worked really well, and like you said above, they save a ton of money! I have really been wanting to try these. Thanks for the review! Very interested in the soap nuts!!! My son breaks out from just about every detergent and we have been searching for a natural product that works!! Thanks for the info! We have been selling Soap Nuts for almost 4 years now and we have never had a single customer report an allergic reaction. I read reviews all the time and you actually seem not only to enjoy the product, but also have a lot of excitement towards it. It makes me want to try it out more. I am interested in the deodorant, and will definitely be reading more about it. Thanks for all the great information. Yeah, it's a little bit too exciting when I find great products that actually work that are all natural AND save me money lol Glad I sparked some interest! It's really worth it to try out. I would love to try the soap nuts!! I would like to try these one day, especially the soap nuts. Heard about those. All natural is the way to go. Thanx again Ali for another great review!